Let’s face it; there aren’t a ton of real-time strategy (RTS) games on consoles. The majority of them are made specifically for mice and keyboard action and don’t translate well to the limited buttons on a console controller. That’s why when I initially saw Bad North I was somewhat excited to see how a RTS would turn out on the Switch. However, as it approached release I realized that in reality the game was more of a tower defense game than a traditional “gather resources and build” endeavor. Nonetheless the end result is still a fun game to pick up and play for a few rounds at a time, but it lacks the depth of strategy I was hoping to find. There’s not a ton of background story here, but the bottom line is that you must protect your civilization from constant attacks from Viking invaders. As seems to be the case with so many games these days, Bad North is a slimmed down lite version, which does lend itself well to playing quick bouts on the handheld. I must admit I sort of miss the sprawling maps and multitasking of older games, but that’s not to say there’s not enough content here. The game presents you with a series of island that you must defend from incoming foes. Each wave comes in via the sea and you must position your small band of troops between the enemies and the homes you’re trying to protect. If you’re successful at the end of a few rounds you’ll earn coins that you can then spend to upgrade your armies. This means you’ll be able to assign them a class, which will determine what weapons they’ll yield. You can have a platoon of archers that can hit far away targets, but will be sitting ducks if you let the enemy overtake them. You also have the swords and shields option, which is useful against enemy archer attacks. Or you could go with the long spears to really hold your ground against encroaching enemies. Since the islands are randomly generated, each play will be different. You never know what kinds of enemies you’re going to go up against in any given level, so that makes it more difficult to know who to bring along with you to your fight. In an early example I had increased my army from two units to four. I decided to only take half of them onto the island and came away victorious. The next island, when I used the other half, I got slaughtered because I didn’t have the right troops to ward off the incoming horde. Unfortunately if your captain falls in battle, he’s dead for good. Luckily you can find new captains on certain islands, but all of the progress you made by assigning skills and whatnot is out the window. I can appreciate this gameplay mechanic, but I’d rather have more tactical information to actually strategize instead of going in blind with every single encounter. Graphically the game goes for a minimalistic approach, but it works well. The islands are somewhat pastel and washed out, and there’s often fog around the area that can hinder your view of incoming enemies. You can freely zoom in and out of the maps to get a better look at what’s going on. Despite its rather cartoony look, the land soon turns red with splatters of blood as battles wage on. I found it sometimes difficult to determine what enemy type was cruising in toward the island without having to zoom in and see what kinds of weapons they were holding. A little icon above them would have helped so I didn’t have to constantly mess with the camera. Although the game does feature a quick tutorial at the beginning, one thing that it failed to mention was how to use your coins you’ve saved up to upgrade your troops. In retrospect I should have noticed that when I had enough coins they began to sparkle, and thus simply tapping on them via the touchscreen would open up the upgrade tree. However, I was primarily playing the game on the TV, and so I had to press down to bring up that menu, and nowhere did the game prompt me to do so. That meant that my entire first play through of the game I couldn’t upgrade my units and I became super frustrated. I even searched online for the answer to no avail. Would it kill developers to include a digital instruction book with their games? I eventually figured everything out, but it’s just a small annoyance I wanted to point out. 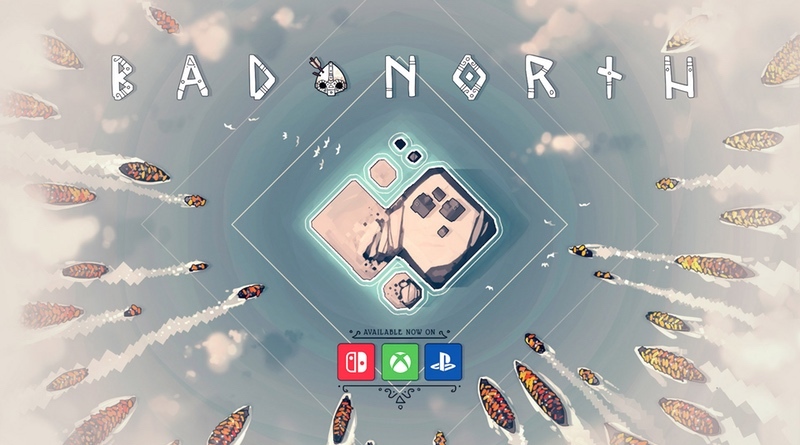 If you enjoy tower defense games mixed with slight RTS elements and don’t mind permadeath and some other roguelite elements like procedurally generated levels, then I’d say give Bad North a try. I wasn’t a fan of many of the game’s mechanisms, but I must admit I kept coming back to play one more round, so it definitely has that addictive quality to it. Bad North is a fun game with light RTS and tower defense mechanics. The levels are short enough to be played in small bursts, which do lend themselves well to the handheld mode. However, the lack of meaningful tactics and strategies left me wanting more. Bad North was reviewed using a final retail Nintendo Switch download code provided by the publisher.